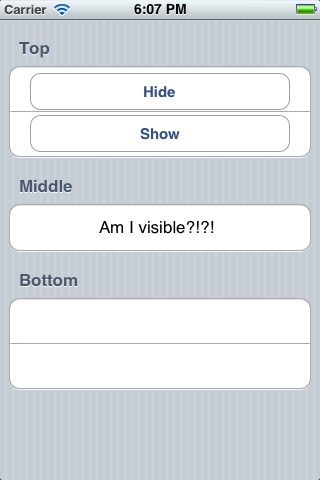 As we have seen previously, getting a UITableView with static cells to show up can be a bit tricky. You need to remove some of the table methods. However, if you want to dynamically show and hide sections at runtime, you will need add one of them back in and put in a little bit of extra effort. The next thing we have to do is make sure the header doesn’t show up. We do it by overriding theset two methods. Note that we are returning 1 in heightForHeaderInSection – if we return 0, it won’t work. Voila! Our section is now properly hidden. 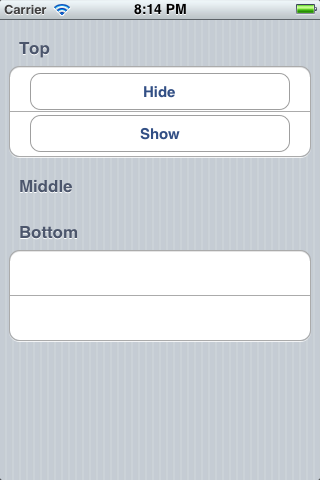 I’m sure this isn’t the ideal way to show and hide sections, but it works well enough for my purposes. And since it took a little bit of effort to figure out, I wanted to share it. Enjoy! Creating Default.png and Default@2x.png images can be a pain. 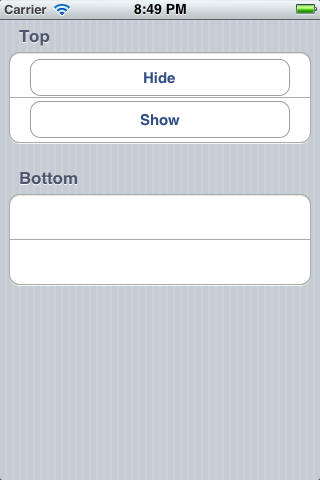 Here are a couple you might find handy if your app involves a UITableView with multiple sections and a UINavigationController. Enjoy! Since my current app requires a sqlite3 database, I naturally hit up Google for some sqlite3 tutorials. I found plenty of tutorials, but sadly, most of them were poorly written and full of dangerous code. The problem? SQL injection. What’s the problem here? Good ol’ Bobby Tables. Depending on what record.name is, your SQL statement may do something that you weren’t expecting (you didn’t want to delete all the records in your table? Should’ve thought of that before writing such unsafe code!). For more details on all the different sqlite3_bind functions, see the SQLite documentation. Sure, avoiding SQL injection attacks in a small iOS app is probably less of an issue than avoiding them in a mission-critical website, but that’s no excuse to do it wrong. And here’s another, even more obvious reason to do it right: If any of your fields have a ” in them, your unsafe SQL statement will fail. The parameterized statement handles quotes correctly. I submitted January’s app to the app store on the 30th, but it’s still waiting for review. So although it’s not technically in the app store yet, I consider this a pretty successful month. And I’m already hard at work on February’s app – this time using Thyme to keep track of exactly how long it takes to build.